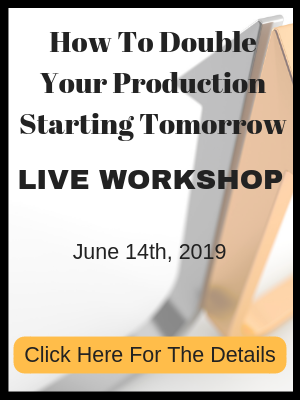 Learn how to make the decisions necessary and implement those changes immediately, to help your team grow and tailor your career to YOU. 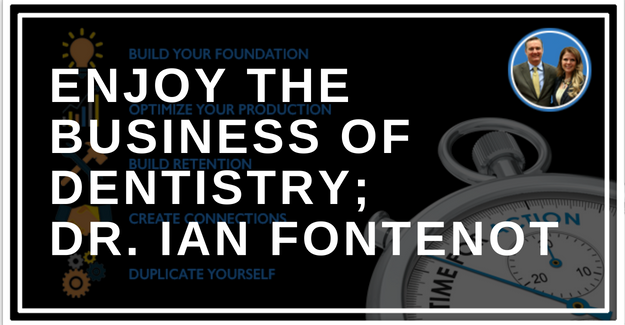 Listen to Dr. John and Wendy interview Dr. Ian Fontenot who is a young second generation dentist, started his practice from scratch and has an incredible new patient flow. He has since doubled his production with team training institute and continues to propel forward making the decision to grow his practice in order to explore other aspects of dentistry. S1 00:00:02.348 [music] Welcome to the Double Your Production Podcast with The Team Training Institute. 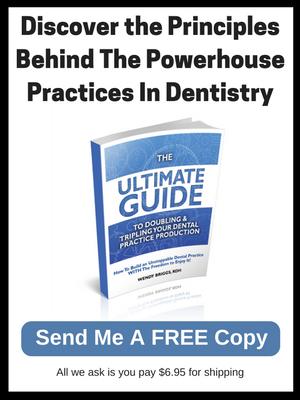 The one place designed for dentists and their staff who want to grow their practices by following in the footsteps of those that have done it, who are in the trenches, who know exactly what you’re going through. And now, your leaders, the stars of the podcast, Dr. John Meis and Wendy Briggs. S2 00:00:29.337 Welcome, everybody, to this Double Your Production podcast. I’m Dr. John Meis, and I’m here with Wendy Briggs and the great Dr. Ian Fotenot. Hey, Dr. Ian. How’s it going? S2 00:00:43.231 You have an absolutely amazing story. Can you kind of fill us in on how you got started, where you came from, and how you got to be where you are now? S3 00:00:54.734 Okay. So I will give it to you and try to be short. So I’m a second-generation dentist. My dad practices about 35 minutes away from me. He’s been there 30 years, small practice, three ops, no hygienists. Basically, just a small operation. So I graduated in 2010 from a general practice residency. I worked a little while in a health center while I was paying some loans off through the government repayment. And I would place implants at my dad’s part-time. S3 00:01:32.206 At about year three or so, I was itching to open my own thing or buy somebody’s practice, so I looked to try to buy someone’s office. And it almost worked out, and it didn’t. So I just remember the moment I decided I’m going to open from scratch. So I picked a location about 30 minutes maybe from where I was practicing. And I just sat there, and I thought that location would be the most interesting. The best place to get started was location-wise. S3 00:02:04.826 When I made the decision to open up, I listened to Howard Forran’s 30-Day MBA. Religiously, every night when I would walk, I’d listen to it. And Dentaltown’s got Leune’s posts from 2005, I think, when he started. So it took me about 30 hours. I went through every single post, and then I just made a decision. I said, “I have to call this dude up and go take his course.” So I took Leune’s course. S3 00:02:32.266 And I opened up in Carencro, Louisiana, which is right outside of Lafayette, Louisiana. It’s the third largest city in Louisiana, about 200,000 people. Carencro itself is about 20,000 people, give or take. So been there about four and a half years. S2 00:02:50.183 And kind of almost right off the bat, you had a tremendous new patient flow. S2 00:02:55.941 So do you want to talk a little bit about where those new patients numbers kind of started, and where they leveled out, and what you did to generate them? S3 00:03:06.035 Yeah. So taking Scott Leune’s course– I mean, he gives you a big ole book. I mean, it’s 200 pages, and it’s like the CliffsNotes. And honestly, I just did almost 80% of what he told me to do. S3 00:03:19.248 So about a month out before, we actually didn’t even have chairs in. A month out, I hired a front desk. I was at an associateship three days a week, and we started scheduling people. I put a banner out in the front that had new patient specials, that whole nine yards. And I dropped probably 80,000 postcards in the first year. The phones were transferred from the office to my cell phone when she wasn’t there. I was paying her two or three days extra when I wasn’t there just to answer the phones. I had a schedule kind of booked out, maybe two or three weeks out. So right when I got there, I had patients. I had two back dental assistants. I had one front desk. S3 00:04:10.540 And I kind of for the first three months ran a Comfort Dental model where I did all the cleanings, the SRPs. I did [inaudible]. I did regular, normal general dentistry. I could’ve been better at hiring because half of the time I didn’t have a dental assistant I was supposed to have. And if I hired that dental assistant, that’s almost my whole entire staff. S3 00:04:35.098 It’s kind of funny. I didn’t tell you this, Dr. John, but when you refer to all the 42 things you need to do right in the practice or so, I had the vacuum pumps bubbling through one of the bathroom floors, and I was trying to prep a crown. S3 00:04:48.808 So if anybody knows about a vac and a compressor, we had to turn it off so I could prep, then turn it back on, and then turn it off, and then turn it back on. So that was interesting. S3 00:05:01.056 [inaudible] 116 new patients on three days a week. And I was working two of the days during the week, and one of the days was Saturday. And three of the other days, I was working at an associateship. That was kind of insane. So month four, we started cash flowing. And I took vacation two weeks from my other job, and I worked at my office. And so when May came around, I was just exhausted, so I hired a hygienist full time. And then I started taking a salary in April maybe, or so. Something like that. So the first three or four months, I lived off of two days or three days of my associateship. S2 00:05:56.991 Be willing to have the phone answered all the time. And if you don’t have someone at the office answering it, it’s going to cell phone. S3 00:06:34.190 –[crosstalk] fee for service. S2 00:06:40.252 –use a banner out in front of your office because there was a good traffic flow, wasn’t there? S3 00:07:47.305 –because I did the cleanings. S4 00:07:56.740 –we often get asked, “How soon do we hire a hygienist?” and, “What are the parameters? How busy does the doctor need to be?” And like Dr. John said, one of the other things that we love about you is how decisive you are. When you make a decision or when you have an idea or something that you feel is the best fit, you take action. S4 00:08:19.550 So talk us through your hygiene story just a little bit for those hygienists that are listening, as well as kind of the evolution about how you found us. S3 00:08:28.817 Okay. So, I mean, I’m sure y’all know way better than I do, but I tried to go off of benchmarks. So on Dentaltown or Leune or whoever, I just try to find what’s a benchmark when you got to bring a hygienist in. And do you bring them in part time? Do you bring them in full time? I don’t know if there’s a great answer. My benchmark was I looked at my wife, and she said, “You’re crazy, and you need to [inaudible] [laughter].” So I said, “Okay.” So I think I’m going down the right street here. S3 00:08:56.124 So the next thing, I said, “Well, if I’m booked out at least two weeks because I was my own expanded-duty dentist/hygienist, then it’s time for me to bring someone at least part time.” And my own decision making – maybe this is right or wrong – I didn’t want a part time person in such a integral position. So I said, “If I’m going to lose money on the other two days that I can’t, I’m just going to lose money because I want a full-time hygienist.” Because I feel like I personally am going to pull more restorative and stuff if I can train a full-time hygienist, that most of her focus is my office and not someone else’s office. So that’s why I pulled the trigger full time hygiene-wise. S3 00:09:38.579 And then I did it, the exact same thing, a year later, and my hygienist was telling me, “Doc, we’re not busy enough for another full-time hygienist.” I’m like, “Don’t worry. It’s going to be okay.” She’s like, “This dude’s crazy.” So I had a hygienist that came straight out of school a year after I hired my first hygienist. And she came, and, man, she was just very presentable. I didn’t even meet her the first time, and I said, “I have to have this hygienist.” So my other hygienist just said, “I just want to hoard hygienists. This is what I want to do [laughter].” So I said, “We are not full time. But she is from the area, and she seems awesome, personable. So I’m going to hire her full time and not go part time.” So it took me a little bit of time to get her busy, but I’m happy that I did it that way. S3 00:10:26.420 So fast forward three years later, about a year and a half ago– yeah, about a year ago. Something like that. I just didn’t know what they needed to be doing to be taking better care of my patients. I didn’t know production-wise what they should even be producing. People threw numbers around. And I didn’t know if it’s a fee-for-service patient practice, what a hygienist should be producing PPO-wise. And I was kind of down in the dumps and looking for who was going to help me with the solution. S3 00:10:59.452 So I looked into Rachel Wall because I was a Productive Dentist Academy client. And I looked into y’all. And I forget how I found Wendy. It might have been through Breakaway. It was through Breakaway. So I went with one of my staff members to Breakaway, and I think I met Keith. And Keith said, “Man, we can double what you doing right now.” And I said, “In a PPO office?” And he said, “I guarantee.” So I just felt really good with Keith. And Burt came for a day. And within the first month, we doubled plus a little bit. Now, my collections didn’t double, but my collections were probably 30, 40% more than they were, which is massive. I mean, it was all the money I was losing. S4 00:11:43.035 Right. Right. 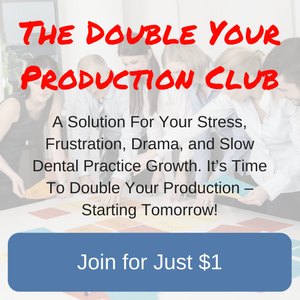 And so we often say the title of this podcast is the Double Your Production Podcast. And it’s not just some catchy title. S4 00:11:52.399 With the right structure and the right systems, that’s what people actually do. Right? S4 00:11:57.631 So talk us through since then. So Burt came in for a day. You saw an immediate double. What did you do then? S3 00:12:04.635 Then I got really scared because I said, “I’m going to have to start buying all kind of stuff and eliminating rooms” because Burt said, “I’m telling you, hold on. You’re going to have to expand this practice.” And I said, “No. Please, no. Please, no [laughter].” So basically, that’s what I started doing. I just started spending cash on stuff. I eliminated a consult room. And luckily, that consult room was already plumbed. Even though [inaudible] told me not to do it, I did it anyway. And I had it plumbed before, when we first opened. But I opened up another room. And, I mean, the growth went from there. I started having to spend money on more scalers and more instruments and more sealant stuff. But, I mean, it has exploded. S3 00:12:49.813 So four months after that time, Burt was like, “You really need to–” because my back was killing me. When I brought Burt, the next month, I basically threw my back out. And I was kind of having to take medicine and stuff to work for a week. It was bad. And, I mean, I’m only 34. I think I saw 70 new patients still at that point. And I should’ve hired a new dentist a long time ago, and that was my fault. But I thought I could just hold down the ship if I worked hard enough because that’s just how I am. But Burt told me, she’s like, “Ian, you can’t keep doing this. You going to have to get help. You need to get another dentist, or you need to do this.” She said, “I think you’d be an amazing Blue Diamond client because I think you have what it takes to take what we tell you to do and do it.” And I said, “Well, something’s got to change because I can’t work like this.” So Burt has been my inspiration. She is awesome. And y’all have been awesome. S3 00:14:18.475 I’m not doing it by the seat of my pants. S2 00:14:20.158 Yeah. Right. Right. But when you have the information, you make a decision. And then how long does it take to execute things for you? S2 00:14:28.315 Yeah. So I’ve been amazed at our Blue Diamond retreats when we talk about a concept, and you can see how it applies to your practice. You’re in the process of implementing it and executing it even before you get that call. So it’s been amazing to watch that. S3 00:14:44.145 The hard part that I hadn’t figured out yet is how do you do that and not kill your team members. So in my old age [laughter], four years later in the startup, I’ve just figured out that there’s only so much I can implement and so fast I can implement it. I’ve got some amazing people, so they have allowed me to do things faster than I think I would have. But the first two years, I went through seven people. And, I mean, I’m in a six-op office now. That’s a lot of people. And it’s not because I think I’m a bad boss. I think I’m a easy boss, honestly, to work with, but I just push so hard. I just want to push so fast, and sometimes you can’t get past that. So I’m trying to learn how to be good at that. S3 00:16:13.997 Yeah. I appreciate that. Yeah. S4 00:16:16.927 The other thing too, Dr. John, let me just also just put a little plug in because those of you listening that are members that subscribe to our training website, we just did a monthly huddle on that exact topic, on change, and how to inspire your team to change, and the phases of change. And I thought it was really, really effective. So if you’re listening to this, and that strikes a chord with you, if you feel like sometimes getting the team on board to change is a challenge, we would encourage you to review that monthly huddle. I believe it was the monthly huddle for June of 2018 where you taught those principles, Dr. John. And I thought it was wonderful. I thought it was really, really good information. S2 00:16:56.496 So you’ve gotten a lot done in a very short amount of time, Dr. Ian. So what’s next? S3 00:17:02.870 Well, the Blue Diamond thing, it’s blown me away. The way the Mastermind is, I mean, it’s taken me to levels that I didn’t think I would go. What’s next? That’s why I came to y’all to try to figure that out. And I sat down and watched that video about legacy and all that stuff and tried to figure out what is really the deal and what am I trying to accomplish. Four years ago, I really just wanted to be the best dentist that I could possibly be, practice by myself, be on no insurance, and just see how far my own production could take me, and just do really cool stuff. And now, man, I’m liking the business part of it. I guess my vision that I see happening is I’m going to try to create a couple of offices maybe that allow me to do things that I just really want to do, and maybe work a little bit less clinically, and try to run more of the business side, and kind of see where that takes me. The problem that I’m having, I wish this was like five years from now so I could just build another office. But, I mean, I outgrew my office more than halfway into it. S3 00:18:19.671 So that’s kind of been a pickle. But what I’ve learned from y’all is I’m trying to create leaders. And Mckenzie – who is literally sitting right here by me [laughter] – what I’m trying to do is create her as a leader and help her lead. And then that way, I can take more time to do the things that I want to do and maybe delve into some finer parts of it, maybe different types of dentistry, or more of the business side of it. That’s kind of where I want to go. S2 00:18:47.697 Yeah. Well, I think you’ll be very good at either one of those. S2 00:19:15.230 –and earn more and build an organization of people that will do a great job, just like you’re doing now with the patients that you have now. S3 00:19:24.379 I guess my big thing is I just really want to serve, and I want to find out how I can serve more. And I want to serve in a capacity that I can do – you know what I’m saying? – as far as I don’t want to do smaller things that other people can do. I want to be able to make a bigger impact and – I don’t know – do some cooler stuff. S2 00:19:44.677 And I think that’s exactly– impact is the perfect word. You are a person that’s going to have a tremendous impact on your community and profession in your area, and I’m really excited that we had the chance to work together. S3 00:19:57.246 Well, I appreciate that. S2 00:19:59.204 So, Wendy, anything else to add? S4 00:20:04.913 –our members look to you for an inspiration of, like Dr. John said, a young gun that is getting things done. And we sure appreciate your spirit and your fire and all the good things that you’re doing and the amazing team you’re building. S3 00:20:19.558 Well, I appreciate that. S2 00:20:20.452 Thanks for being with us on the podcast. S3 00:20:22.267 Definitely. Have a good one. Bye, everybody. S4 00:20:24.985 Take care, Dr. Ian. Bye-bye. 3. June monthly huddle can be found on our member website found above for a $1 trial period.